With over 90 calves born at the San Diego Zoo Safari Park, we are the world’s leader in white rhino breeding. However, the zoo population is no longer self-sustaining due to limited reproduction in females born at our institution and others across the globe. As poaching reaches unprecedented levels, a healthy, productive zoo population of white rhinos that can serve as a safety net against extinction has never been more important. San Diego Zoo researchers have been working on this problem for decades. Our Recovery Ecology scientists have ruled out behavioral differences between wild and zoo-born females as a probable cause. More recently, our Reproductive Sciences researchers have assessed current and historic diets for zoo-housed rhinos in relation to decreased reproduction. They have discovered that a significant portion of rhino diets contain estrogen-mimicking compounds that have the potential to alter reproductive development and contribute to diminished breeding success. Currently, efforts are underway in collaboration with our Nutritional Services Department to formulate improved diets for white rhinos in zoos that will maintain their reproductive health. Together with our partners, we are committed to enhancing the survival of rhinos in the wild. San Diego Zoo Global has a long partnership with the International Rhino Foundation as a member of their Zoo Partners Program. With funding assistance from the San Diego Zoo, the International Rhino Foundation works to protect vulnerable white rhino populations in South Africa, while also helping to develop new methods to combat and reduce poaching. There are only two northern white rhinos remaining in the world. 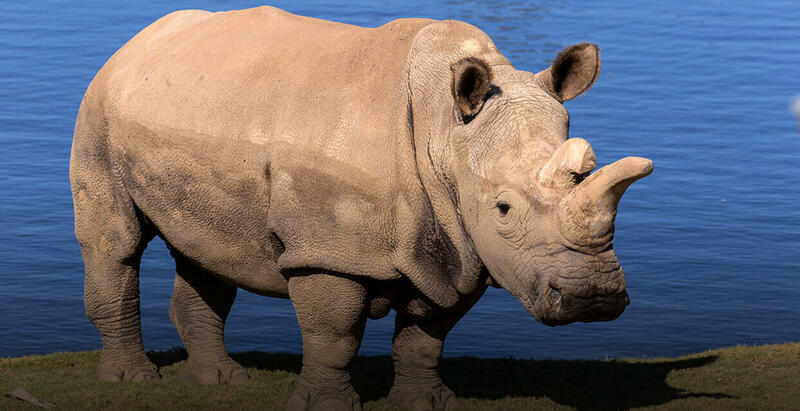 Consistent with our vision to lead the fight against extinction, San Diego Zoo Global has made an organization-wide commitment to rescue the northern white rhino from the brink of extinction. With so few animals remaining, saving the northern white rhino will require cutting-edge science and the resources of the Frozen Zoo®. Researchers in our Reproductive Sciences team are developing assisted reproductive technologies, including artificial insemination, in vitro fertilization, and embryo transfer, using southern white rhinos as a model species that may one day serve a surrogate mother role. Meanwhile, our Conservation Genetics team is analyzing whole genome sequences of nine northern white rhinos and four southern white rhinos. The 12 northern white rhino cell lines in the Frozen Zoo® will be used to develop stem cells to create northern white rhino sperm and oocytes for the generation of embryos. One day we hope to see this species saved through successful births of northern white rhino calves at the Nikita Kahn Rhino Rescue Center. I recently travelled to South Africa to train with a collaborator to the Northern White Rhino Initiative, Dr. Morné de la Rey of EmbryoPlus. He has been working on a method to collect viable oocytes from living rhinoceros donors in a procedure called ‘ovum pick up’ (OPU).